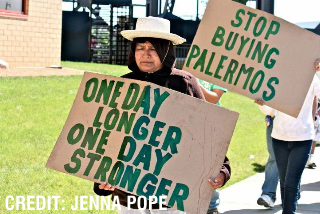 The latest on Palermo's factory workers in Milwaukee and SEIU janitors in Houston who are fighting for fair treatment and a decent wage. In 2007, Cesar was operating the Multivac machine that wraps frozen pizzas produced at Palermo’s Pizza factory in Milwaukee, Wisconsin. Like most of the others in the factory, he worked seven days a week—the 9 pm to 7 am shift, earning $7.25 an hour—for one of the largest frozen pizza manufacturers in the nation. According to Cesar, he had complained to his supervisor for a week that the equipment wasn’t functioning properly—it wasn’t sealing correctly and he also needed to pull the plastic out of the machine by hand. He told me the company’s lack of responsiveness was par for the course. For Cesar, Palermo’s emphasis on production over safety came at a great personal cost. When he was pulling the plastic out of the Mulitvac his finger got wrapped in it. He couldn’t untangle it before the knife came down to slice the plastic. He said his right index finger “was cut almost completely through, just hanging by my skin.” The finger was reattached at the hospital, but he’s still unable to move the part that was severed, and on cold days it’s particularly painful. Voces is a low-wage worker and immigrant rights center in Milwaukee, and Palermo workers complained to organizers about wage issues, health and safety violations, lack of paid sick days and a generally intimidating environment. The workers say they had gotten nowhere—repeatedly—in their efforts to get management to address their concerns. Palermo’s declined to respond to the specific allegations raised in this article, but Chris Dresselhuys, director of marketing, e-mailed a general response. Raul, who operated a cheese shredder, has a decidedly different take. He said he complained many times to supervisors and management about the speed of his production line. Thirteen workers were supposed to produce forty pizzas per minute, but five members of his team were often moved to a different line because the shop was understaffed. He also worried that the shredder didn’t have the capacity to handle the volume of cheese necessary to produce at that speed, so it often shorted out, forcing him to insert his hand and he feared electrocution. In addition, there was an ongoing problem with the floors—the drains clogged so people were often working in standing water mixed with oily ingredients. Raul said he consistently raised these issues with supervisors and management for the three years he worked at Palermo’s. For that, he was branded “a big troublemaker” and someone who didn’t work hard. But he was hardly alone. Many complained of the lack of sick days and needing to work when they were ill. According to the workers, there was an unwritten rule that if a worker took three days off in six months he or she would be fired. Emilio and Maria both worked at the factory for many years and have a 3-year-old girl. After seven years, Maria earned $9.05 per hour, working seven days a week. 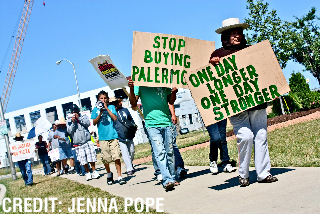 By November 2011, the Palermo workers had had enough. They decided they wanted to form a union and turned to Voces for legal assistance. 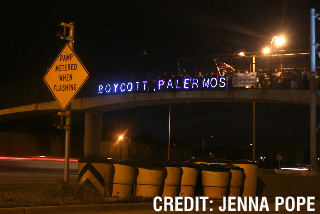 On May 27 of this year, 178 Palermo’s employees—about three-fourths of the company’s production workers—signed petitions authorizing an independent union, the Palermo Workers Union, to act as their collective bargaining representative. This is when things went from ugly to uglier. 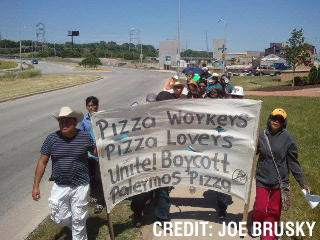 Two days later, the workers asked Palermo’s to recognize the union. The company refused, and also said that eighty-nine of the workers needed to reverify their immigration status within twenty-eight days because of an audit by US Immigration and Customs Enforcement (ICE). According to the workers, they were also told to train a large number of temporary workers who had been brought into the factory that day. In response, the workers engaged in a brief work stoppage to protest their treatment. The next day, a delegation of Palermo workers, elected officials, religious leaders and Voces staff met with company officials. The delegation was informed by the company that ICE had shortened the twenty-eight-day reverification process to just ten days. But the United Steelworkers contacted the local ICE office on the workers’ behalf and were told by the supervisory agent that ICE hadn’t given Palermo’s a specific deadline to reverify immigration status at all—not twenty-eight days, not ten days—no date. “So we caught them on that lie—which showed this clearly wasn’t about immigration, it was about union-busting,” said Christine Neumann-Ortiz, executive director of Voces. In his official statement, Dresselhuys insisted that “the situation is the result of an investigation initiated by ICE” that “determined that some employees were ineligible to work” in the United States. “Palermo’s cooperated with ICE and obeyed the law,” he said. The AFL-CIO petitioned ICE to suspend the audit until the labor dispute and union election were complete, asserting that it was being used to threaten the workers’ right to self-organize—a right protected no matter one’s immigration status. On June 1, the workers say they arrived at the factory to find that temporary workers had once again been brought in. They called a strike, with workers from the second and third shifts starting the picket line. According to a number of accounts, when workers from the first shift tried to join the strike, doors were locked, supervisors blocked exits and workers were told they couldn’t leave and needed to return to work. Some exited through emergency doors. One worker said he was grabbed by a company vice president and told he would be fired if he left the building. According to Voces, only when the organization called the police were the remaining workers permitted to leave the building, with approximately 150 workers in all joining the picket line. Six days later, on June 7, ICE decided to suspend the reverification process until the labor dispute was resolved. Despite ICE’s decision, Palermo’s sent termination notices the following day to seventy-five workers on the “suspect document list.” In essence, the company unilaterally accelerated the reverification process and fired the workers even though their immigration status is still yet to be determined. Additionally, Neumann-Ortiz said, Palermo’s “permanently replaced” any permanent workers and “verbally fired” temp workers who supported the strike. For its part, Palermo’s denies any union-busting effort. A decision from the NLRB on the Unfair Labor Practices charges is expected in mid-August. If the NLRB decides the charges have merit, it could order an administrative trial, ask a court to reinstate the strikers immediately or even order the company to bargain with the union right away. The Palermo workers, union members, community leaders and students from the United States Student Association (USSA) also launched a national boycott of Palermo’s on Sunday, asking Costco to pull the company’s products from its shelves. According to the Palermo Workers Union, more than 50 percent of Palermo’s frozen pizza sales are to Costco, and organizations around the country are holding “informational pickets” outside of Costco stores, asking that Palermo’s sales be halted until the workers are reinstated without retaliation. The boycott will then focus on Safeway and Kroger, the next two largest retailers of Palermo’s pizza. Boycott organizers also say that for the public this isn’t just an ethical matter of speaking out on how low-wage workers are treated, but an economic one—about how tax dollars are put to use. In the past five years, Palermo’s has received approximately $20 million in tax subsidies, construction financing and public bonds from city, state and federal sources. Palermo’s defends its record in the community. “We have demonstrated a commitment to the community and support numerous charities and nonprofit groups in a variety of different ways,” said Dresselhuys. As the strike continues, increasing economic pressures have led to moments of tension between some of the workers, but these moments are the exception rather than the rule. “We’ve all worked very honorably at this company and all we are asking for is that our rights be respected,” said Maria. Note: The names of these workers have been changed, or last names withheld, to protect their identities. 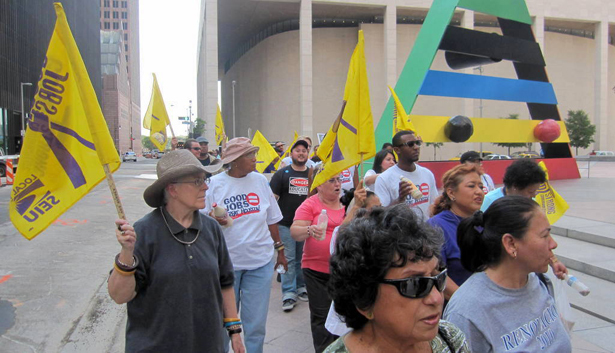 Fifteen community and labor activists at a recent protest in downtown Houston’s energy corridor clearly agreed with Mayor Parker. They locked arms, sat down, and blocked traffic at a major intersection surrounded by high-rises. They were arrested and spent the next twenty-four hours in jail. “We were the only gray-haired ones,” said Dave Atwood, describing himself and his wife, Priscilla. Dave is a 71-year-old retired chemical engineer who worked for Shell Oil for over twenty-five years. Priscilla is a retired nurse who declined to give her age, but Dave says “she is a little younger than I am.” They have lived in Houston since 1971. Dave and Priscilla first got involved with the janitors in 2006 when the workers were organizing to form a union. They attended a rally downtown. “Sticking with them” has meant showing up for marches and rallies, being part of delegations that speak with business leaders, and trying to raise the public’s consciousness about the janitors’ struggle through their interfaith work. Recently, Dave and Priscilla were part of a delegation that spoke with Mark Cover, a vice president at Hines Real Estate, an international company with its US headquarters located in Houston. Also in the delegation were the Texas state director of SEIU Local 1, Elsa Caballero, a Catholic priest and nun, and three janitors. Dave said Cover was “hospitable” and listened to the stories of the janitors and to the delegation’s appeal. “We try to make [business people] understand that if the janitors do better, their children are going to do better, and it’s going to be better for the entire community,” Dave said. He said some of the janitors’ kids are dropping out of school to work and “help put food on the table”—that they don’t have the luxury to think about the long-term. Cover told the delegation he’s a person of faith, too, and Dave felt good about the meeting. But that was two months ago, and Cover never responded to Dave’s follow-up email. Dave said his and Pricilla’s values are informed by Catholic social justice teachings, including “solidarity with your brothers and sisters in a struggle for a better life, and the preferential option for the poor.” According to Dave, the preferential option teaches that when you make decisions in society you give priority to the poor, and the impact a decision is going to have on the poor. “And if it doesn’t have a good impact on the poor, then you shouldn’t make that decision,” said Dave. He feels that faith institutions need to do a better job talking about justice issues in order to help people “awaken to the reality that if people are treated fairly and justly, it will be good for the entire human family.” He and other activists are doing their best to get a diversity of faith traditions involved in the janitors’ struggle. Dave and Priscilla are clear on how high the stakes are for this fight. They are hopeful that people of all backgrounds will continue to step forward—even if they are busy with their families, their jobs, their own daily grind. There have now been sixty-six total arrests for civil disobedience. Note: As this post went to press, an SEIU spokesman told me that the janitors were back at the bargaining table with the cleaning contractors, but no progress had been made. “Call my office,” Mr. Dimon replied, before his entourage ushered him toward an exit. A few days ago, having heard that Mr. Dimon never returned Ms. Vasquez’s call, I checked in with the company to find out why not? He also said that the bank only has a branch with fifteen employees at JPMorgan Chase Towers where Vasquez works, and the corporation doesn’t own the building. But did he think JPMorgan Chase might be able to influence the negotiations if Mr. Dimon told the cleaning contractors that the janitors who clean their offices should earn a higher wage? The spokesman didn’t want to engage in a hypothetical. Well, are there other buildings that JPMorgan Chase does own in Houston where they could clearly have a say in how the janitors are treated? Those buildings are managed by outside companies who contract with cleaning services, the spokesman said. They are part of an investment portfolio managed by JPMorgan but owned by institutions, pension funds and individuals. When I told SEIU that JPMorgan said Ms. Vasquez never called, a spokesman said that that was bunk—the union and Ms. Vasquez called and spoke with Thao Doan of the JPMorgan Chase Executive Office. I called Ms. Doan and left a voicemail asking could she confirm this? She didn’t return my call. I’d be hurt, but there seems to be a lot of that going around. Maybe you can do better than I’ve done at getting some answers; or, more importantly, at convincing JPMorgan that it actually does have a role to play in raising the poverty-level wages of the workers who sanitize their bathrooms and workspaces, empty the trash, vacuum the floors—do the hard work the company depends on every day to operate in a clean and healthy environment. 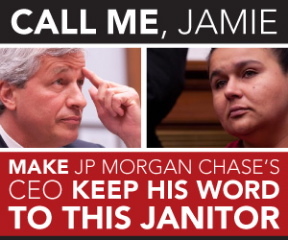 SEIU has launched a national campaign calling on Mr. Dimon to meet with Ms. Vasquez. You can send him an e-mail. If you get anywhere with him, let me know. 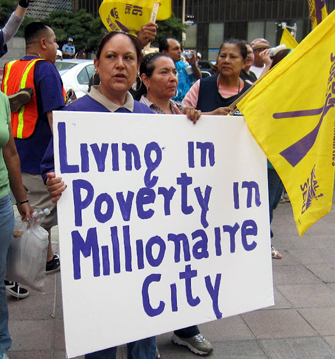 author of So Rich, So Poor: Why It’s So Hard to End Poverty in America. This Week in Poverty posts every Friday morning. Please comment below. You can also e-mail me at WeekInPoverty@me.comand follow me on Twitter.